Devil’s claw is the common name of the plant Harpagophytum procumbens. The herb is only found in the wild – but only in the Kalahari desert of Southern Africa and even now, it is a difficult plant to cultivate. 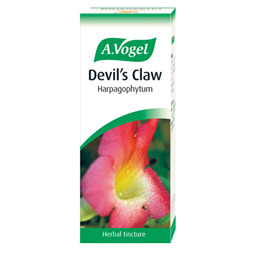 The root of Devil’s claw is used in herbal remedies for the treatment of muscle and joint pains, backache and rheumatism. It is made from extracts of Devil’s Claw herb cultivated in the Kalahari without the use of artificial fertilisers, insecticides or fungicides. 15 - 20 drops 2 to 3 times daily in a little water. Below are reviews of A Vogel Devils Claw - Muscle & Joints - Tincture - 100ml by bodykind customers. If you have tried this product we'd love to hear what you think so please leave a review. Brilliant, I have found great benefit. I started using this and within about three days my low back ache went. I'm at an age when my hormonal state is changing (perimenopause) and aches and pains can be a problem. This product has made me feel so much better because I'm not aching when I walk some distance thus adding to my feeling of wellbeing because I can exercise more. Devil’s claw is the common name of the plant Harpagophytum procumbens. The herb is only found in the wild – but only in the Kalahari desert of Southern Africa and even now, it is a difficult plant to cultivate.